Please note that our Jackpot now stands at a Whopping €8,800. Now is the time if you are not already signed up to register. Not only are you helping your club but you are in with the chance of a great win. There was no Match 4 winner of the Club Lotto on Friday, 18th July when the numbers drawn were 4, 13, 23 and 30. It is €2 per week but goes a long way towards running all the facilities that we have. Dave Munro receives €25. Further details are available at www.brayemmets.com. Yes that’s right Bray Emmets are preparing to host a Strictly Bray Emmets Dancing Event. Have you ever fancied yourself as a dancer,,,,, we know that some of you have been seen to strut some moves. Professional lessons will be provided to all dancers and the date will be released over the next few weeks. If you can help in anyway or would like to get involved please contact Dermot O’Brien or any committee member. Our Junior Footballers continued their championship campaign with a good win on Sunday in Greystones against neighbours Enniskerry. The lads have been working hard all year. Well done to Ian and all involved. 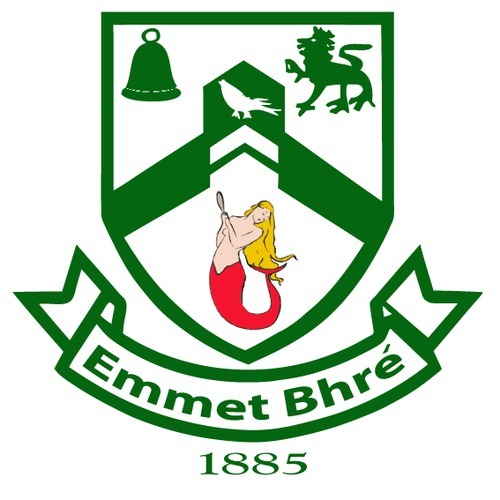 Emmet Bhré 3-9, Shillelagh 0-8. The Junior hurlers needed victory on Tuesday 15th July to secure first place in the 2014 Junior hurling league and they did not disappoint. This has been as strong a Junior squad as Bray have had, with this group combining skillful youth and the experience of older heads. Comhghairdeas mór le gach duine. Foireann : Barry Cowan, Alan Sweeney, Enda McHugh, Paul Barry, Jordan Lee, Cathal Reddin, Mick Walsh, Ryan Tynan (0-1), David Ebbs, Barry Cunningham, Eoin Fox (0-2), Luke O’Reilly (0-1, Captaen), Bill Moorehouse, Bill Maher (2-0), John Ward. Ben McCormack (1-5), Enda Ó Maolmhuaidh, Shane Anders, Colin Salmon, William Robinson. Bainisteoir – John Ward. The lads continue their Championship run this Thursday evening in Pairc Emmet Bhre Old Conna Avenue on Thursday Evening when they take on Arklow Rock Parnell at 7.30pm. On Saturday morning the girls travelled down to St. Pats in Wicklow for their first Co. Wicklow football blitz of the season. First up were An Tochar, Aibhe made sure the ball stayed away from her net, while Cara battled away wherever she could for the Bray effort, Olivia made some great runs forward which helped contribute to a Bray victory. The second match played on another pitch against the first of two St. Pat’s teams, Kaleigh kept herself busy, ensuring that Bray attacked the St. Pat’s goal, Amy made several skilful pickups, Martha made several interceptions and Roisin tackled well in midfield. At the final whistle the scores were level. The third and final match was against another strong St Pat’s team, Ellen O’D was tasked with marking the St Pat’s star player which she did with determination and to great effect, Ellen W made some great runs and Eimear’s passing ensured Bray kept possession of the ball, a cruel last second goal to St. Pats levelled the scores and denied Bray a deserved victory. On Friday night the Under 13 boys welcomed Eire Og to Bray for a football match. Eire Og got off to a great start and were several scores ahead before Bray began to get in to the match. The Bray lads who were only playing together for their third match of the season did not let their heads drop and after a slow first five minutes started to play well as a team. Davy, Gavin and Conrad began to dominate their areas well and Sean took some physical knocks for the team. Ben and Andrew scored some vital goals between them to leave Bray only one point adrift at the break. At the beginning of the second half Conor D had to leave the field for some first aid, this strengthened Eire Og’s resolve as they pulled several scores in front, Conor D re-entered the pitch after 5 minutes and this in turn strengthened Bray’s resolve. A determined duo of Rory and Oisin at the back kept the Eire Og’s scores to a minimum with Stephen, David and Conor H at the other end showing some neat passing and accurate shooting to accrue several goals and points between them. At the final whistle the resolute determination of the Bray lads had turned a healthy Eire Og lead into a 2 point victory for Bray Emmets. Well done lads.